At Lucy J Design, we offer you dedicated personalised care and attention through every step of your renovation. Designers, Project Managers, Plumbers, Electricians, Tilers, Builders and Cleaners are all part of our professional team. Lucy J Design only handles a limited number of Bathrooms, Kitchens and Laundries per year. This means that we are able to dedicate more time on your Bathroom, Kitchen or Laundry Renovation, ensuring everything flows smoothly whilst providing unparalleled service. All of our Bathrooms, Kitchens and Laundries adhere to our strict schedule. You will have peace of mind knowing where we’re at in the process, of your new customised renovation. Integrity is our highest value and the benchmark we hold ourselves to. We construct your Bathroom, Kitchen or Laundry as if it was our own, with meticulous attention to detail. Over 30 Years of Experience ensures there's no challenge we haven't experienced in our renovations. This means that we are able to dedicate more time on your kitchen or bathroom, ensuring everything flows smoothly whilst providing unparalleled service. All Lucy J Design Bathrooms, Kitchens and Laundries come with a 6 year warranty on our workmanship. 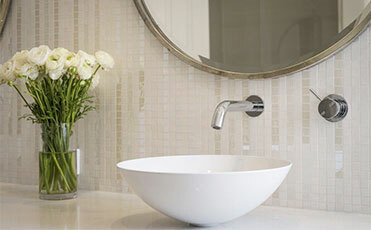 We only recommend the use the highest quality tapware and accessories for each custom project. Lucy J Design is a family owned WA business run by Pat & Lucy Gauder Specialising in the renovation of Bathrooms, Kitchens and Laundries. Between us we have over 30 years experience. In more recent times our son Steven has joined the company and is involved as a project manager. To provide beautiful bathrooms, kitchens and laundries to the general public. To provide professional design, building and co-ordination of all trades necessary to complete the project. To provide the highest level of service throughout the project using licensed tradespeople. To comply with all Australian standards and Housing Industry Association rules and regulations. To design and provide detailed plans and specifications where the client wants to handle their own project. We have renovated thousands of bathrooms in the years we’ve been in this industry. Lucy J design is a full service company making the whole process of renovating, rewarding and seamless. Our knowledge and expertise is focus on your Bathroom, giving you practical advice on the layout, fixtures, fittings and finishes. Resulting in a smooth running project, stunning room, completed on time, which will serve you for decades to come. Functional, beautiful kitchens don’t just happen…… they take hours of careful planning, knowledge of design and construction, and an understanding of materials, finishes and color. You have the perfect opportunity to do it right. You can expect many compliments, but, best of all will be the liberating experience of working effortlessly in a Lucy J Kitchen, built especially for you. Renovating your Laundry requires all the knowledge and expertise of a kitchen or bathroom renovation. It must be functional, have as much storage as possible and cater to your family’s requirements. 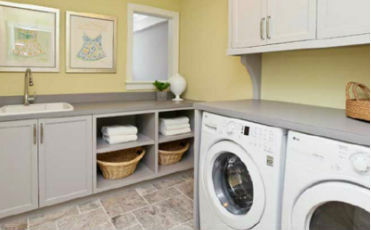 A well designed and renovated laundry, can make a huge difference to your family’s level of organization. If you can’t find a home for something – it’s sure to end up in the laundry. Thank you so much for all the hard work you put into our new bathroom. We were very pleased with the way the workmen went about their jobs and how pleasant they were at all times. With grateful thanks to you and your staff. I am writing to you all to express our gratitude in the outstanding work that you carried out for us in our recent bathroom renovation. From start when we first met with Pat to the finish of the renovation all of the tradespeople were polite and professional, always keeping us informed of the progress of our bathroom. It was very assuring having Steve coming in every day to check on the progress of our bathroom, nothing was ever any trouble for him and he was always willing to ensure that we were happy with everything. We are so pleased with our new bathroom, it is everything that we hoped it would be. We would be more than happy to recommend you and your company to anyone who requires any bathroom or kitchen renovations. Please feel free to use this letter as a testimonial of the outstanding work that you and your trades people provide. Thank you again for making our dreams come true. I’d like to thank Lucy J Design and all their tradesmen for completing my bathroom makeover with the minimum of fuss and disruption and the maximum of efficiency and professional expertise. The finished job has met my expectations in terms of the quality of the tiling, painting, plumbing and glazing. The new look adds to the aesthetic appeal of the house and to its market value. I will be pleased to recommend Lucy J Design and their teams to anyone considering a bathroom makeover. The planning, coordination, service, quality and timing left nothing to be desired. Many thanks to you and your team for the wonderful work you have done. The ensuite is a pleasure to stumble into in the morning, light and bright. The whole thing is such a contrast to the grim state it was in. The family bathroom is also a very light, bright, airy place now and with the tiles complimenting those in the ensuite the house is beginning to look as though some planning has gone into it. Moving on to the laundry, this is no longer a place to be avoided. Neat, clean and tidy and again a much lighter, brighter place. I am really glad we got together on this project. Your ideas have certainly paid off and I cannot sing the praises of your team too highly. We would like to say a BIG thank you so very much for both of our beautiful new bathrooms! It has been an absolute pleasure working with Pat, Steve and all of the tradesmen involved in transforming both rooms for us. We couldn’t be happier with the high level of service and quality of workmanship provided. Thank you all so much again for all of your help and support and we are most certainly enjoying our new rooms. Thank you, firstly, we would like to say how responsive and proactive you both were in the initial contact and planning of our bathrooms renovations. The demolishing contractor was excellent and we were glad that we took your advice with the dust extractor. All your selected tradespersons in their respective discipline were of a high calibre and prompt. The tilers were excellent in carrying out their work and courteous. Job well done! We are extremely happy with our new bathroom and have thoroughly been enjoying it. Overall we were happy with the tradesmen on our move, whilst we didn’t get to meet all of them, we were happy with the standard of work overall and very happy with our dealings with Eddie (the tiler), he is a credit to your company. 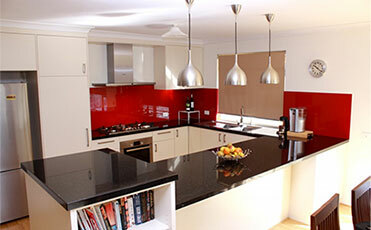 Steve was great, he was quick to respond and sort out any issues or queries that we had during the renovation. Overall our experience with Lucy J Design was a good one and we would recommend your company to people looking to renovate their bathroom, laundry or kitchen in the future. Joan and I would like to thank you for the excellent job you did in renovating our bathroom. From start to finish the work was done professionally and as promised. Pat worked hard to keep costs to the initial quotation that he made and was ably assisted by Stephan in his coordination and oversight of the work. All finishes are to a high standard and the overall result is better than we anticipated. Thank you so much for the amazing job you have done with our bathroom and laundry renovation. Apart from the friendly and ‘can do’ approach exhibited by both yourself and Steve, our project manager, all tradespeople, without exception, were highly skilled and professional, making what could have been a stressful time surprisingly easy. The entire Lucy J Design team certainly showed their integrity and desire for an exceptional standard of service and craftsmanship at all stages of the project. We are very happy with the bathroom and laundry and would not hesitate to recommend Lucy J Design to anyone looking to undertake renovations. Once again, many thanks. I wanted to thank you both and all the people who worked to complete our bathroom and laundry. I wanted to especially thank Mark whose attention to detail in the tiling is second to none. The finished product is more than I hoped for – we just love our new bathroom. The whole process getting the work done was surprisingly stress free so thank you Steve for making this possible. Thank you for our beautiful new bathroom. I have to keep going to look at it as I cannot believe the transformation. We found that all of the workmen did an excellent job; they arrived on time, were pleasant and polite and kept the mess down to a minimum when working in our home. On the Monday the removal of our old bathroom was done efficiently and quickly, it did not cause us any inconvenience or distress. On the Tuesday the plumbers worked well as a team and soon had the old plumbing out and the new plumbing in. I appreciated the advice. The young electrician also did a good job quietly getting on with their work. Thank you to you and everyone who worked on our bathroom project, we are so pleased with the end results. The laundry is fantastic and life changing! As for your staff – you and Pat were amazing as was Steve when you were away. Your secretary is also very efficient and a pleasure to deal with. The only tradesmen that I had a lot to do with were Dylan, your electrician and Chris the tiler. Both were outstanding. Thank you again and we will definitely be recommending you to our friends. Absolutely stunning” Lucy, we were the envy of our friends come Christmas time, thanks so much for squeezing us in on such short notice. Dear Lucy, we are very happy with the new kitchen, your professional approach and ideas were backed up by a great staff. Thank you for all the hard work put in by you and your workmen. We found all of your team to be hardworking and extremely easy to work with. The work was carried out with the minimum of fuss and we were kept informed at all stages of the work as to what would be happening next. The quality of the workmanship was excellent and the final result exceeded our expectations. We are extremely happy with the finished job and would recommend your services to anyone. Regarding the experience we had with your tradespeople, I am happy to report the following! In a nutshell, they were great, in fact, I have been singing your praises to anyone that will listen! The guys were friendly, promptly on time, clean in their work and courteous. Somewhat unusual they have the ability to work in together handling different trades in the tight confines of a bathroom, without swearing or ‘doing their block’. The quality of the work is to say the least, professional. We were kept abreast of what was next going to happen and when, and any minor changes that we made were accommodated without even a rolling of the eyes! Are we happy with your company, ‘You bettcha, and we have advised our friends to obtain a quote from you guys for their proposed bathroom reno. I guess the acid test for any contractor is if you can answer the question; would you have them back? Absolutely yes, in fact we have two more bathrooms and a kitchen on the ‘to do’ list and when the dust settles and the money is available we will be calling for your assistance. Great job!! Just a quick note to say thanks for the wonderful, friendly and professional service we definitely will be passing on some of your cards to our friends. Thank you for your services. We are very happy with the final result. The tradesmen you use have been great and found them to be helpful and ‘nice guys’. Your promptness in any matters was happily seen to and we would be happy to recommend you. “Many thanks for your care and not to mention your patience! The bathroom looks great. Lucy, thank you for designing our lovely kitchen. We really appreciate your professional service and care taken with us, you were a delight to deal with. Thank you for the specs Lucy, I’m so happy now that I can visualise how it all will look. Thanks for the help, I have passed on a tonne of your cards already so you should expect some calls. We are so impressed with our new rooms, a truely wonderful finish to our house.